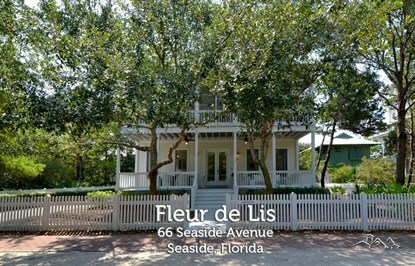 With beach-inspired décor and beautiful pickled hardwood floors throughout, Fleur de Lis is a 3-bedroom, 2.5 bath cottage that sleeps 7 in comfortable, coastal style. 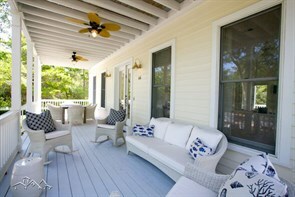 Located on the glorious Seaside Avenue, this cottage has a large front porch that welcomes you into a spacious living area, fully-equipped kitchen, a dining area, and an outdoor porch with a grill in the back. 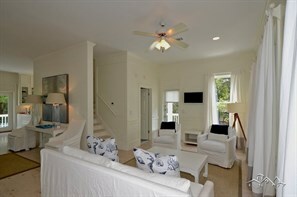 All bedrooms have access to a screened-in balcony porch to enjoy the great views of town. More information.